Have You Discovered Black Garlic Yet? Garlic has a long history of medicinal use, dating back as far as the Ancient Egyptians who used it to treat a variety of conditions ranging from heart disease and worms to cancer. Over three thousand years later, food scientists have discovered how to intensify its beneficial effects. Black garlic is highly prized for its soft, savoury-sweet flavour reminiscent of molasses with balsamic and garlic undertones. Originally popular in Asia, black garlic is now available in mainstream supermarkets and features on the menu of high-end restaurants. Black garlic is produced via a natural fermentation process, under carefully controlled conditions of high temperature and humidity. This converts its unique, unstable and smelly sulphur-containing compounds, such as allicin, into more stable, odourless substances as well as producing the characteristic dark pigments known as melanoidins. 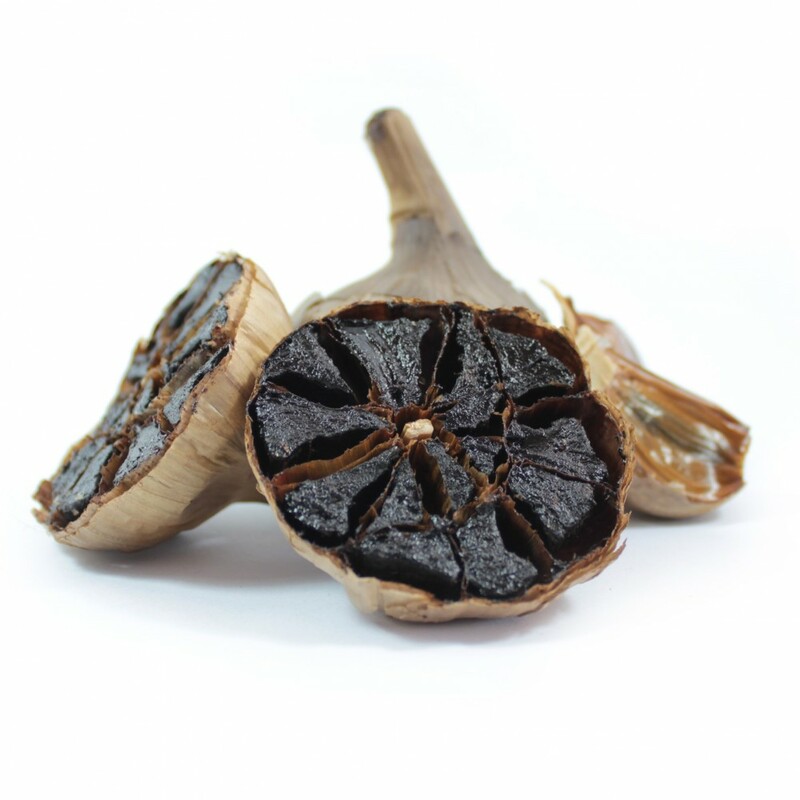 Aged black garlic has an even stronger antioxidant potential than non-fermented raw garlic and is growing in popularity as a medicinal food – its significantly reduced odour may not keep vampires at bay, but offers definite social benefits! Raised glucose levels generate free radicals that are associated with a number of diabetes complications. Black garlic helps to quench these through its powerful antioxidant action and may also improve glucose control. Black garlic helps to improve cholesterol balance by increasing the production of ‘good’ HDL-cholesterol which protects against hardening and furring up of the arteries. It also helps to reduce the accumulation of fat in liver cells. Black garlic increases the activity of immune cells that fight viral and bacterial infections. Preliminary laboratory studies also suggest black garlic extracts can block the growth of some types of cancers, including stomach, colon, lung and leukaemia cancer cells. Anecdotal evidence suggests that black garlic may reduce symptoms of rhinitis and watering eyes by reducing the production of IgE antibodies linked with allergic reactions. While it’s not guaranteed to work, it’s worth trying if you have troublesome symptoms. Use in any savoury dish, wherever you would normally use raw garlic. Add it towards the end of cooking for maximum effect. Black garlic food supplements are also available. A typical dose is 200mg concentrated extract, equivalent to 2g whole black garlic. Note - If you have diabetes and decide to take any supplements, monitor your blood glucose levels carefully. If in doubt, talk to your doctor or pharmacist. Had never heard of black garlic until now Sarah - thanks!